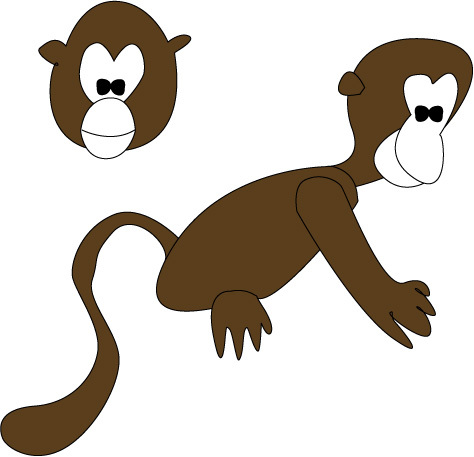 That is Mab the Monkey, Sacha-Giraffe’s best friend, which he meets in the first story. These are stories I started writing for my nephew Sacha two years ago, when he was three. It all began when he said that, before being a boy, he had been a giraffe. (I’m told many children, at an early age, claim to have been something or someone else before, and with time they forget about it.) So I started writing stories about him as a giraffe, with many of the other characters having the name of people around him (for instance, his mom is an owl — she really like those). And, well, in these, I’m a young monkey. I haven’t yet figured actually what that means. i like it! how sweet! If you want to know what happens in this first story, there’s actually an English version now.